BODY BUSTER FITNESS® MORE THAN YOUR TYPICAL BOOTCAMP! Come join us this summer for a fitness program that gets you EXCITED about getting into shape. Enjoy our program in South Surrey or Langley and get fit FAST while having fun in a co-ed, group environment. 1 hour classes, from 2 to 5 days per week, morning or evening options available. Visit http://www.BodyBusterFitness.com to find out more! Or give us a call at 604-595-4429 and we'd be more than happy to answer any questions you may have. Join us at this convenient Outdoor location in Surrey! Located on 34th and King George Blvd, the beautiful grassy field and large lot are ideal for Body Buster® classes! Classes run outdoors on Tuesday and Thursday evenings at 6:30pm. Outdoor fitness is refreshing, energizing and fun! Boost your enthusiasm by exercising outdoors! Get in shape fast, get better sleep, and enjoy the warmer weather we're getting! Take part in our upcoming 4 week bootcamp programs! "I feel confident that I am making progress each and every opportunity I am in a class." I have been with Body Buster for the duration of a year and a half. My enrollment was based on proximity to home and the challenge of trying something new. My immediate interest in the program began as an evening member. Working full-time and being a full-time parent, the evening classes were no longer suitable to my schedule. After reviewing the many options available to me, I have switched to the 6am program three times a week. My workouts are consistent and work for me!! The instructors are amazing! Huy and Dan are top-notch! They are two instructors that challenge me each and every class. Even with some modifications to aspects of my program, I feel confident that I am making progress each and every opportunity I am in a class! The instructors are knowledgeable, approachable and understanding of the diverse work out needs of their members. My gauge is my clothing! I have toned, slimmed down in my thighs and legs and have lost a dress size and a half. Overall I am pleased and continue to make progress in my workouts! My overall health has been fantastic. I feel happier, healthier and more active than ever. Having a program as rigorous as Body Buster can be intimidating, but the overall benefit surpasses the intimidation. As a long term member, I will continue my association with Body Buster because of the overall feeling of great health and fitness! I have gained a sense of self-confidence being a member of Body Buster. I was still battling my weight after having my daughter and Body Buster allowed me to re-shape my body. Weekly classes have a specific focus, which benefit my overall performance and ability. In addition my overall physical strength and endurance have improved. Try it because you will love it! Don’t let the first class intimidate you….stick with it! 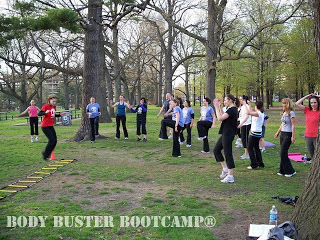 Get fit OUTDOORS this Spring and Summer with Body Buster Fitness! The Next Program Starts May 27th And We Want YOU There! 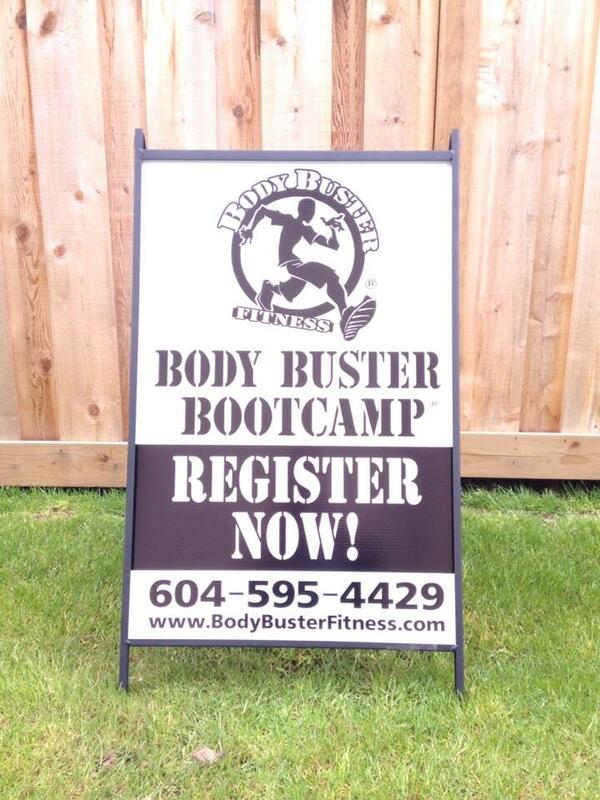 Sign up with Friends and SAVE BIG on Fitness Bootcamps in Langley! SAVE $50 each when registering with 3 friends! Make the commitment to yourself and each other to invest in your health today! No one Body Buster workout is ever the same! A great workout for men and women of all ages and fitness levels! Body Buster workouts are like personal training in a group setting for a fraction of the cost! Get the motivation you need to make positive changes!